When Monty was 11 years old, she went swimming with friends, grabbed a fence that was electrified by a stray live wire and was shocked on the spot. She passed out and slipped into the water. A friend went for help but at first CPR and other attempts to resuscitate her didn’t work. Then suddenly Monty woke up! She suffered no ill effects from the electric shock or from the time in the water! This experience proved to be life changing. Earlier Monty had seen the change in her parents when they had accepted Christ as their Savior. She says, “I saw my parents having something more and I wanted it but I wanted it to be the real deal.” She knew it was only God who could change her and give her the hope and joy her parents had, but she had doubts. She had prayed for God to reveal Himself to her. After the swimming incident, she thought, God, you have the power to take my physical life and to spare it. I also want the spiritual life you offer. That day Monty dedicated her life to God’s plan! Monty’s artistic talent led her to a degree in graphic design, but she still yearned for more. She left Mexico for three years of schooling at Christ for the Nations Institute in Texas, where she consecrated her life and talents to the work of God. She married an Irishman and they moved to Ireland, where she continued to seek where God wanted her to work. 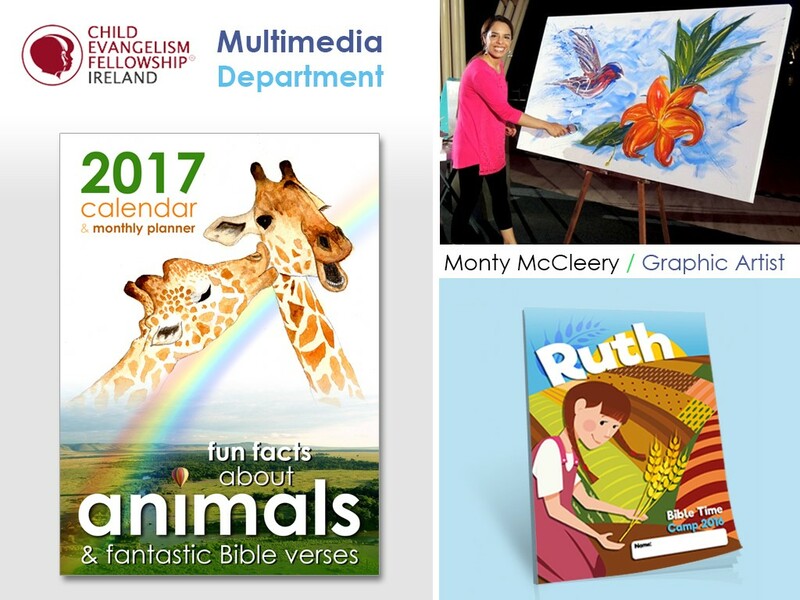 After many interviews and much prayer, a door finally opened for Monty to work part time with the graphic design department at Child Evangelism Fellowship® of Ireland for one year. After ten months Monty was offered a permanent position with CEF of Ireland. God continued to show Monty His plan by allowing her to come to CEF International Headquarters to be a translator during National Directors Institute. She is very thankful for this opportunity as she has learned much to share back home to broaden her work.